This all in one style of e cigarette device is a great starter package/ backup for all styles of Vapers. JoyeTech AIO eGo has a 2ml liquid holding capacity and sports a 510 drip tip with a unique spiral design, which helps alleviate spit back. AIO eGo refill system features a childproof lock, where the user must press down while twisting the top to take it off and have access to the liquid chamber. The top also acts as your air flow control which you can adjust by turning clockwise and counter clockwise. AIO eGo has a liquid display window with a max fill line to show the user where to fill it for the perfect amount of liquid. 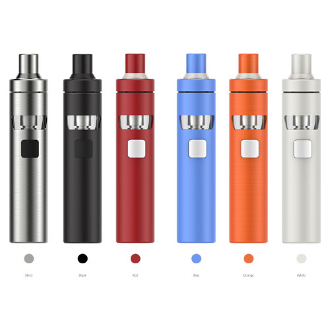 The AIO eGo D22 has a built in 1500 mAh battery capacity with a pass thru function where the user can charge and vape at the same time, making for a very reliable device! Another cool device feature is your ability to choose your own LED Color. Simply power off your device (five clicks to the power button), than hold down the power button, once a light pops up each time you click the power button a new color will appear. When you see the color you want simply stop touching the buttons, and when you power the device back on (five clicks to the power button) your color should now be in place.